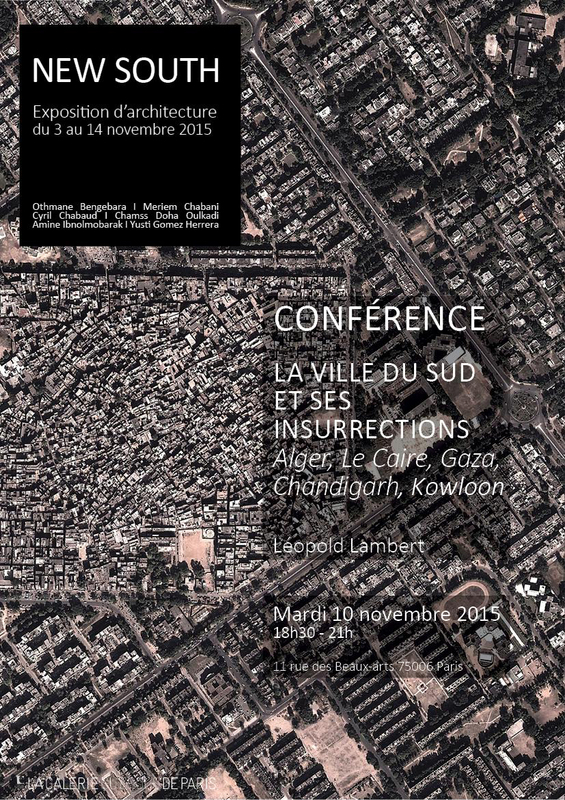 On November 10th, I was invited by friend Meriem Chabani to give a small lecture in Paris in the context of the exhibition New South that she curated around six architecture students’ thesis projects engaging cities of the Global South in Bangladesh, Saudi Arabia, Burkina Faso, Morocco and the Canaries. 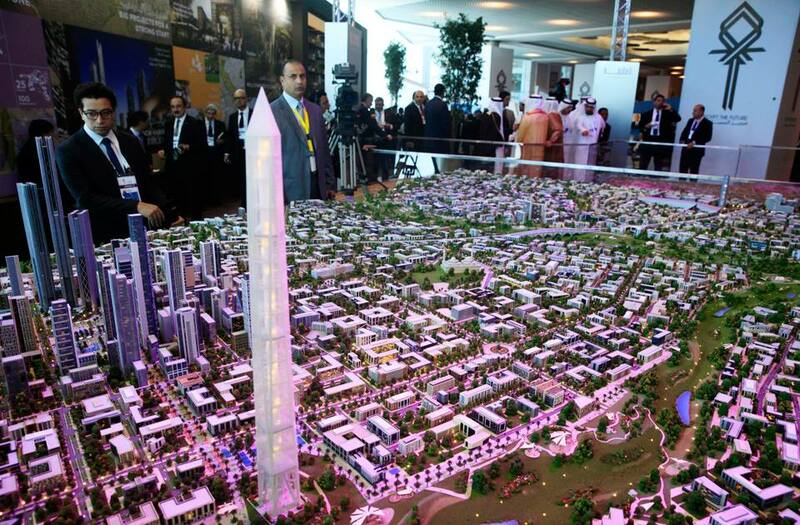 I started writing a digest of this presentation here the next day but the Nov. 13 attacks occurred and I am profoundly sadden to announce that, Amine Ibnolmobarak, the brilliant and kind author of the project for Mecca in this exhibition, was killed in the shootings. Despite the shock of this news and the difficulty to mourn in the maddening noise of the journalistic and political state of emergency, his friends gathered around his family, and remembered with emotion his life in the great hall of the Beaux Arts school last Friday. 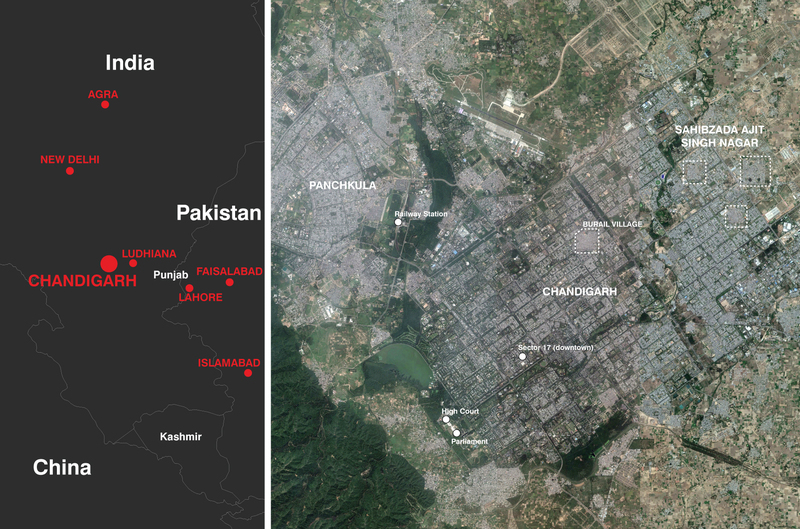 This presentation constitutes a rather shallow examination of five cities’ reciprocal influence between their urban fabric and their insurrections and counter-insurrections operations. In order to make the presentation clearer, I produced a few new maps and thus propose to include my slides here, as well as a few notes to explain them. 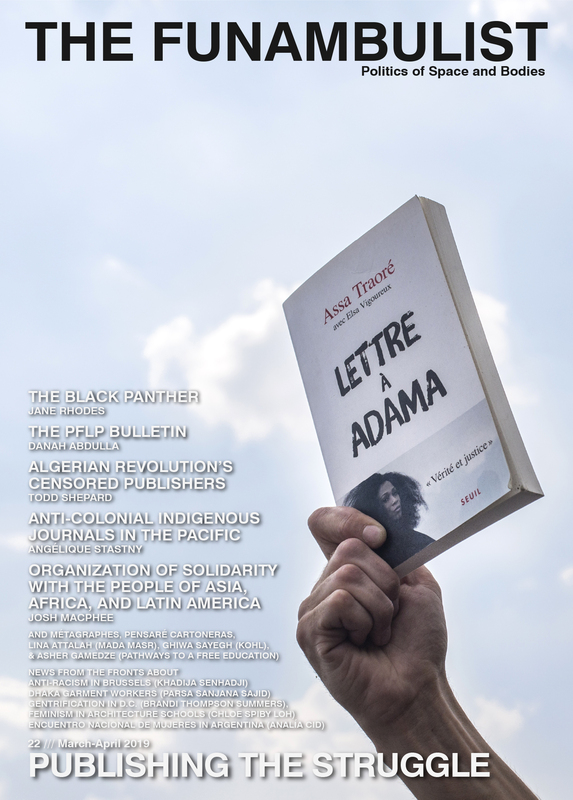 Invitation and video of the lecture. 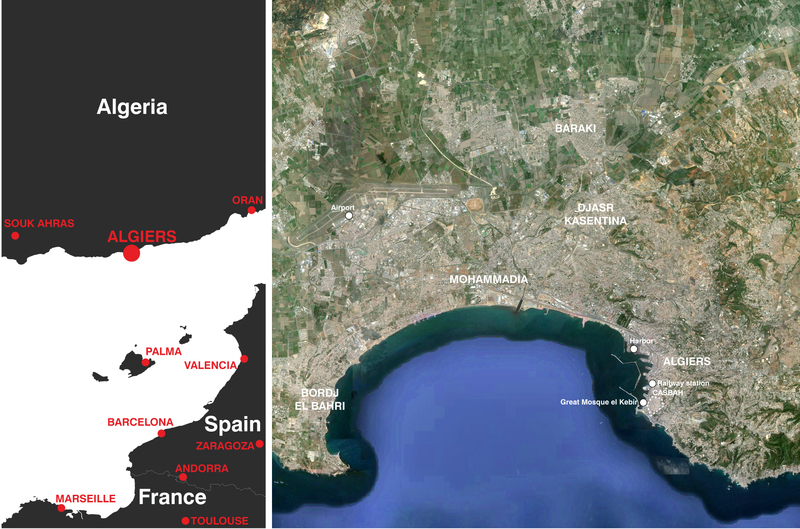 When situating world cities in relation to each other, the choice of projection for a world map already participates to inform a narrative about the importance of the Global South. Traditional projections in the West tend to emphasize the size of the North of the Globe, while the one presented here favors an importance around the Equator line, placing the five cities examined here on a world map where the Global South appears as central. Since the lecture was presented in Paris, and that the first city examined is Algiers, the introduction consisted in addressing the strategies of counter-insurrection undertaken by the same actors in France and in the newly colonized Algeria starting 1830. 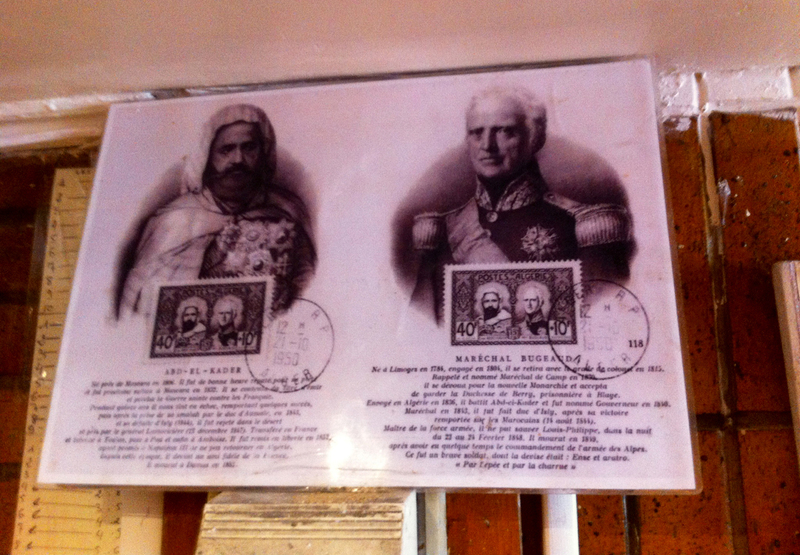 This photograph that I took in a Berber restaurant in Belleville (Paris) remembers one of these actors: the French Marshall Thomas-Robert Bugeaud, here associated to his opponent, the main resistor against colonization, Emir Abdelkader. In 1840, Bugeaud is named General Governor of Algeria by Adolphe Thiers, also involved in the counter-insurrection politics on both sides of the Mediterranean Sea since, thirty one years later, he will give the orders to exterminate the Paris Commune during the Bloody Week of May 1871 (see the “chrono-cartography of the Paris Commune“). Bugeaud, in charge of the “pacification” of Algeria will operate on this side of the Mediterranean until 1847. During the French revolution of 1848, he plays a substantial role in the counter-insurrection and later this year, he writes a short manual entitled The War of Houses and Streets (see past article), which proposes a new counter-insurrection doctrine to the French army that attempts to operate within a similar logic than the insurgents themselves (a common way of thinking with many of the counter-insurrection strategists, as we will see through the example of Ariel Sharon further). 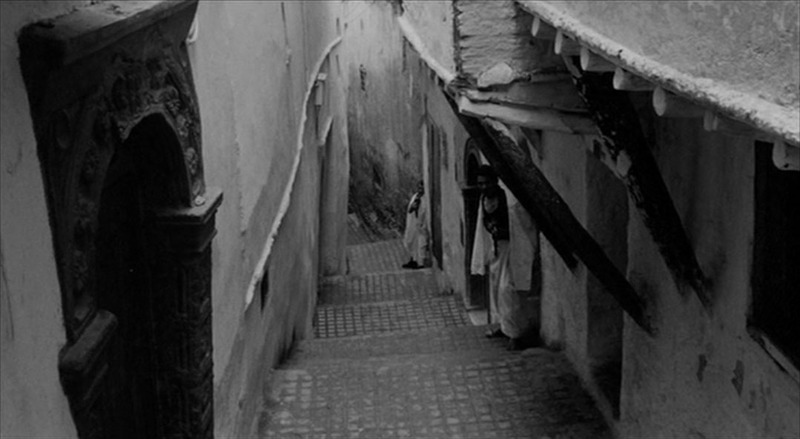 Algier’s Casbah, its dense urban fabric and sinuous labyrinthine streets. 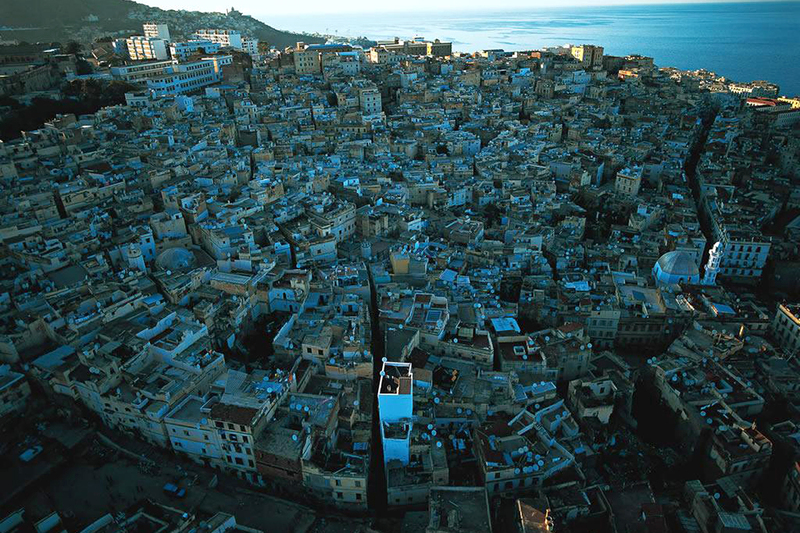 As described in a past article, one of the first actions undertaken by the French army after it conquest of Algiers in 1830 is the ‘administrativization’ of the old city, the dense and labyrinthine Casbah. They thus name the streets — the imaginaries of these names is also a colonial enterprise — and attributes a number to each house. Such an administrative and military process allows the association of identities to urban location, and thus a more thorough policing. 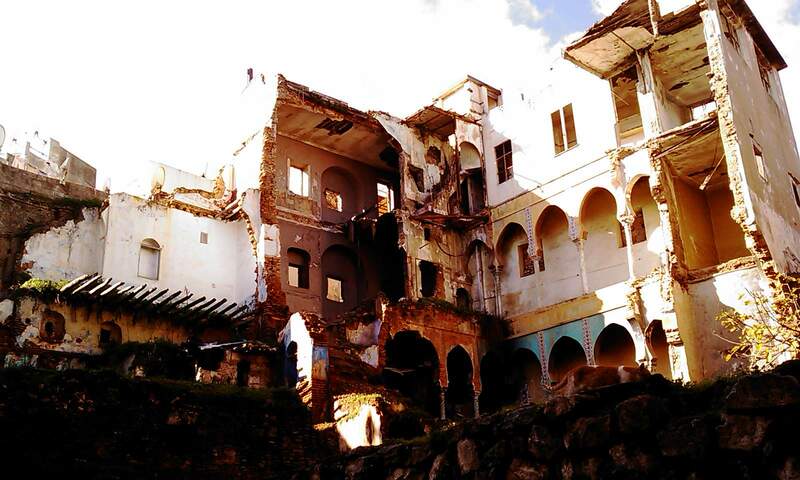 As the picture above illustrates in comparison to current aerial photographs, the counter-insurrection strategy of the colonial authorities also consisted in the destruction of the entire Low-Casbah, thus denying the old city to reach the sea — a significant insurrectional component. 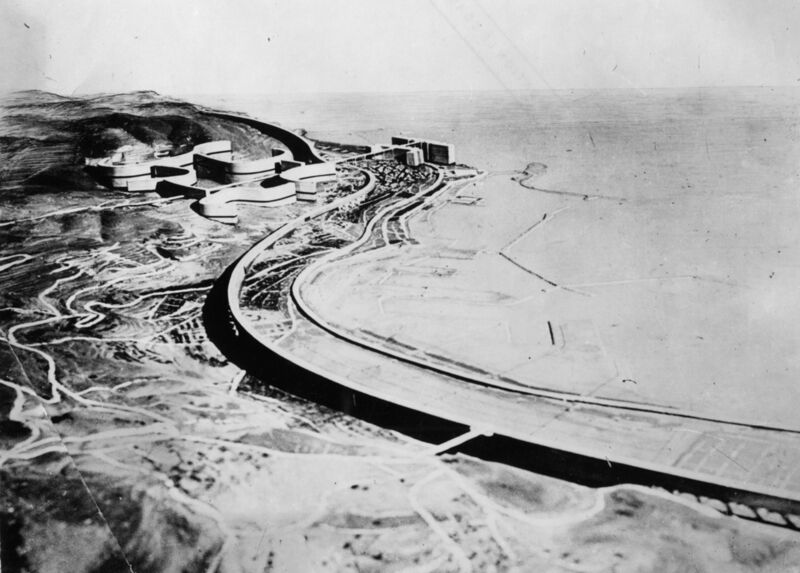 In 1933, Le Corbusier presents his “Plan Obus” (a plan that appears to carry a militarized agenda just by its name, since obus means a bomb shell) for Algiers. 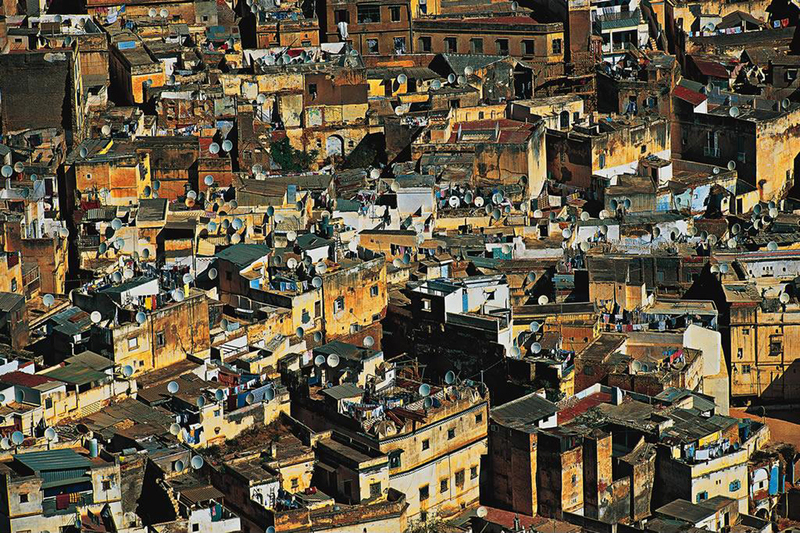 Expressing an orientalized vision of the Casbah, Le Corbusier includes the latter in his master plan, as merely a fetishized object that his new city’s inhabitants would look down to from the height of his elevated highways. 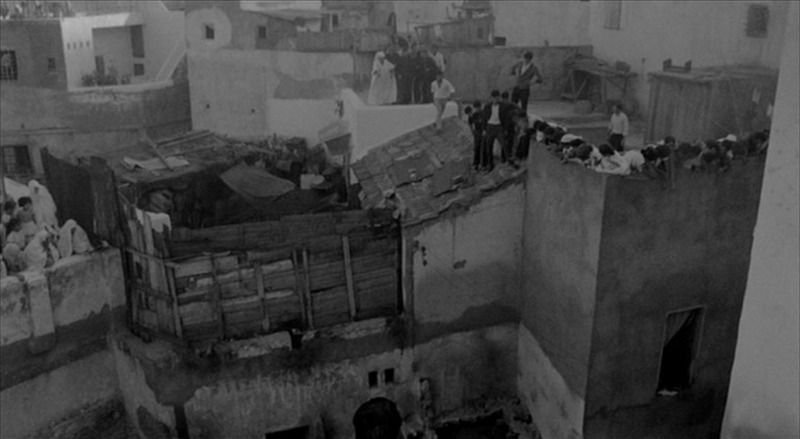 For a broader, yet concise context, see the text “Blocking the Casbah: Le Corbusier’s Algerian Fantasy” by Brian Ackley. 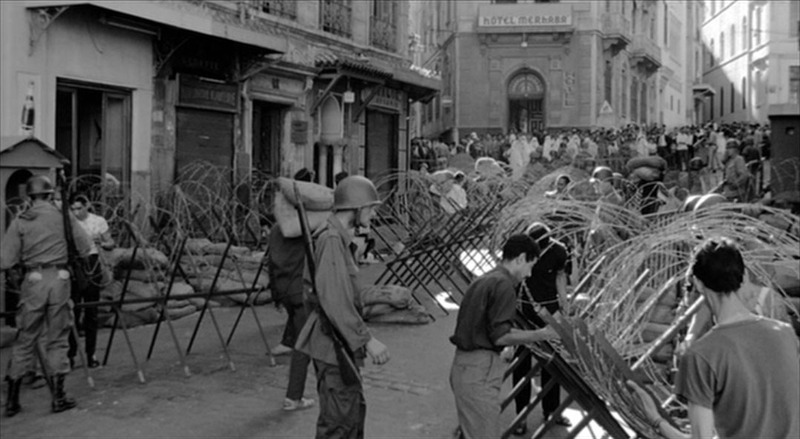 The following images are stills from Gilo Pontecorvo’s canonical Battle of Algiers (1966), released only four years after Algeria’s independence and thus embodying a form of historical reconstitution of the Algerian revolution engaged by the FLN (National Liberation Front) from and in Algiers’ Casbah between 1954 and 1958. 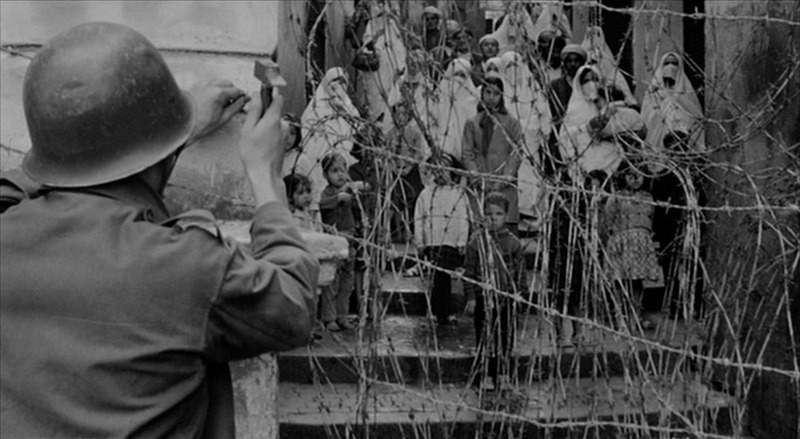 The film shows the efforts of the French army, in particular its paratrooper division, to control the Casbah, gather the intelligence to unmask the members of the FLN, and capture or kill them. The precision given by the film is such that the Pentagon itself organized a screening in 2003, at the beginning of the US-UK invasion of Iraq. 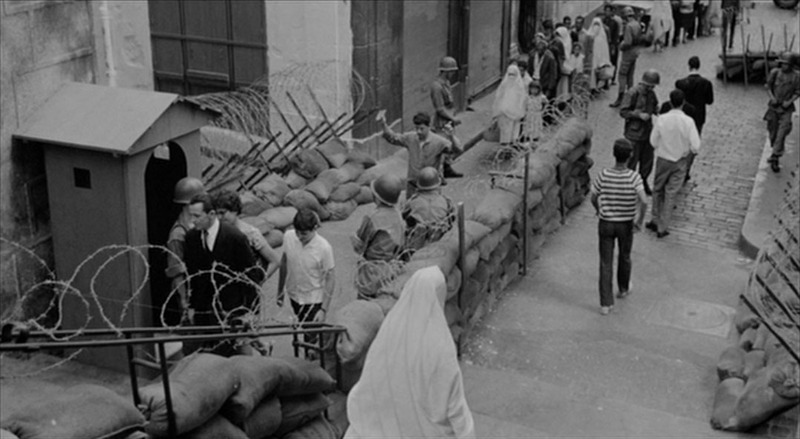 Closing of the Casbah and implementation of checkpoints to control the in and out of its inhabitants. 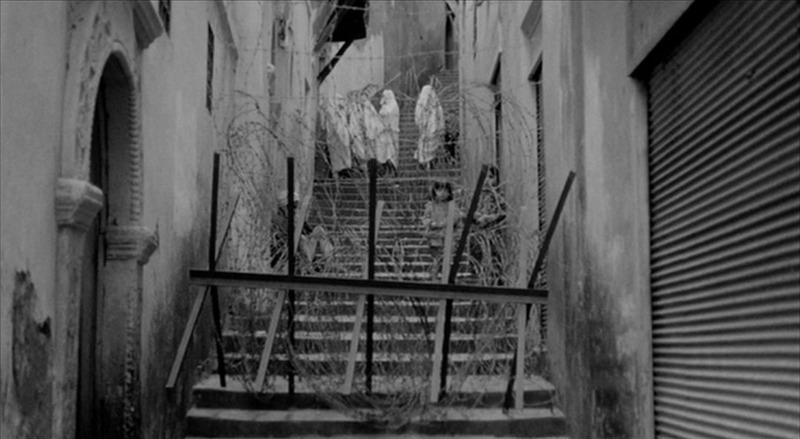 The film shows well the usual discrimination at work in who gets actually controlled and how, when three female members of the FLN carrying bombs succeeds in not being control by adopting a behavior and appearance that corresponds more to the French settler population than the Algerian colonized one. 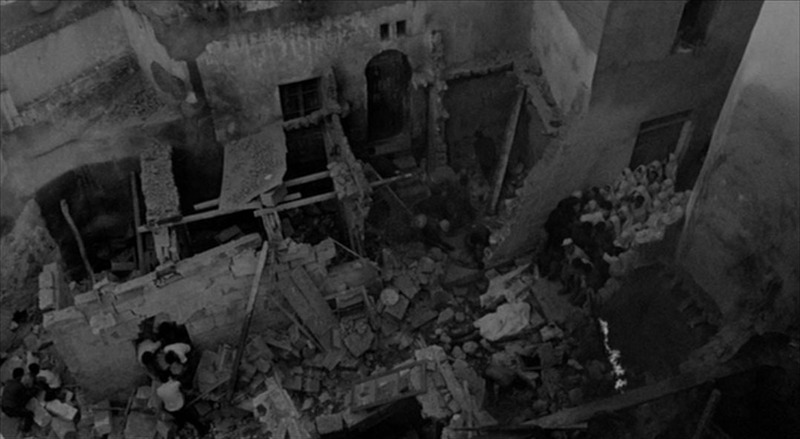 Actual photograph of the house where a key member of the FLN, Ali la Pointe was hiding from the French army that dynamited the house. 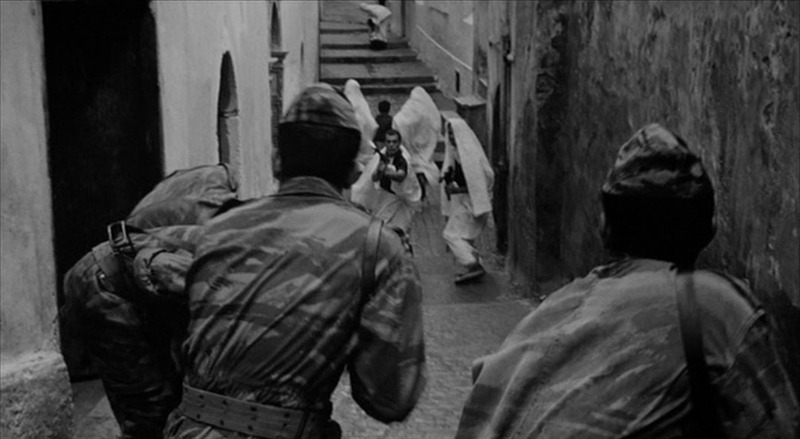 The sinuous streets of the Casbah allowed to organize a relatively successful swarming guerrilla despite the extreme weapon and technological asymmetry at work between the FLN and the French army. 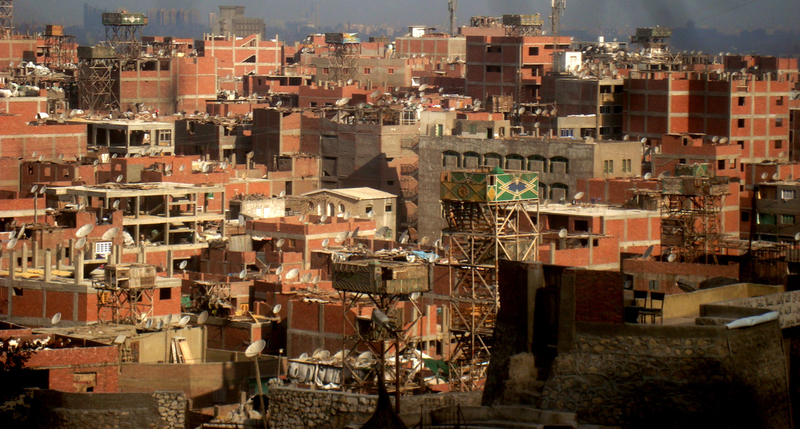 The massive and dense informal settlements of Cairo are neighborhoods difficult to control for the military authorities. 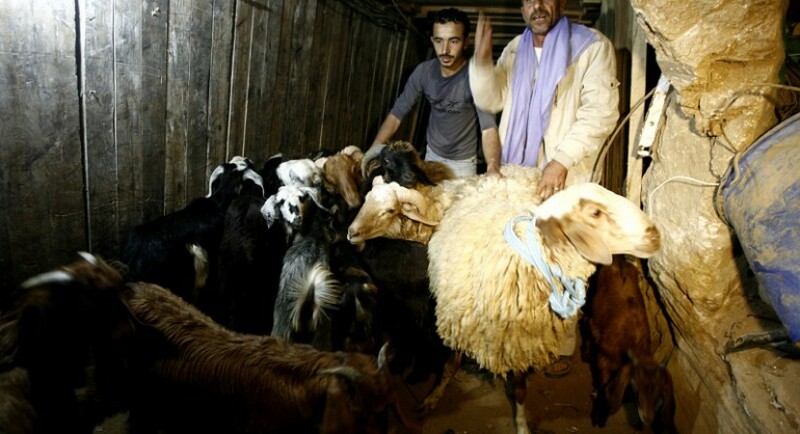 Read more on friend Mohamed Elshahed’s blog, Cairobserver. 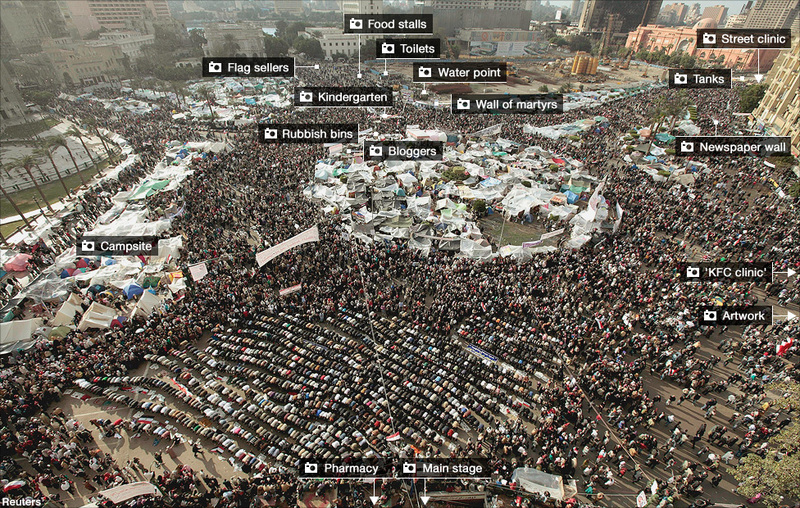 Many things have been already written about the space of Tahrir Square that allowed the 18-day Egyptian Revolution to exist (see the review of Eyal Weizman’s Roundabout Revolutions for instance). 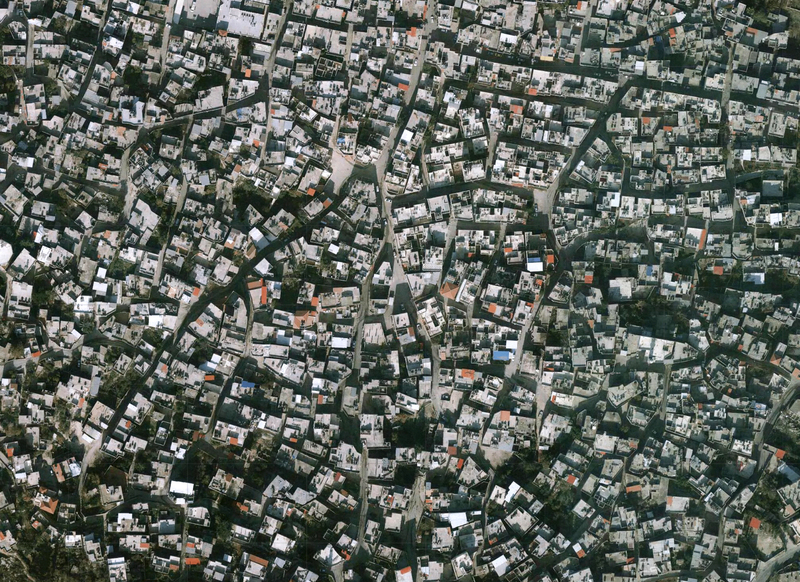 The size of the void it allows in the city combined to the amount of bodies willing to inhabit it, as well as its access and location in the city made it a propitious space for such an insurrection. 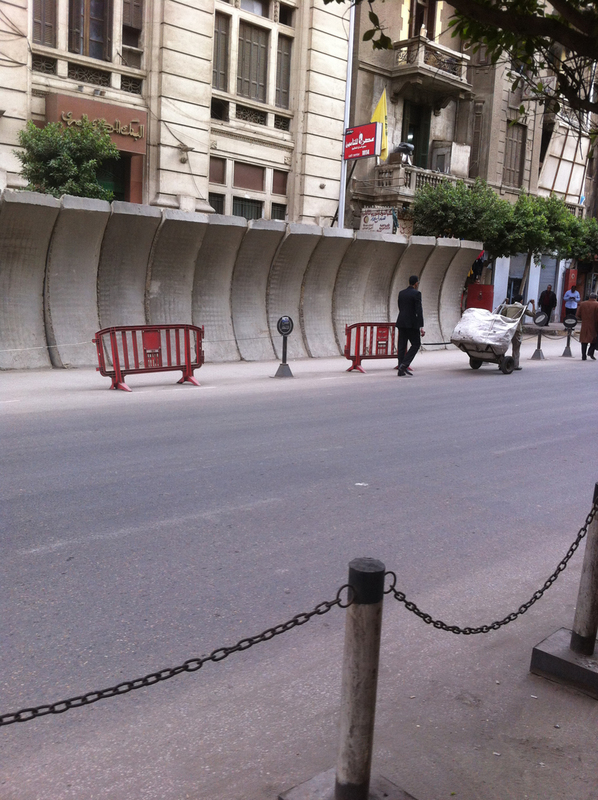 (Photos by Léopold Lambert, February 2015) As already presented in two articles about “Cairo’s objects’ narratives” and “the dangerousness of the photograph,” several zones of Cairo are now barricaded to restrict their access to public servants, following the July 2013 coup d’etat that brought Marhsall Abdel Fattah el-Sisi at the head of the country. 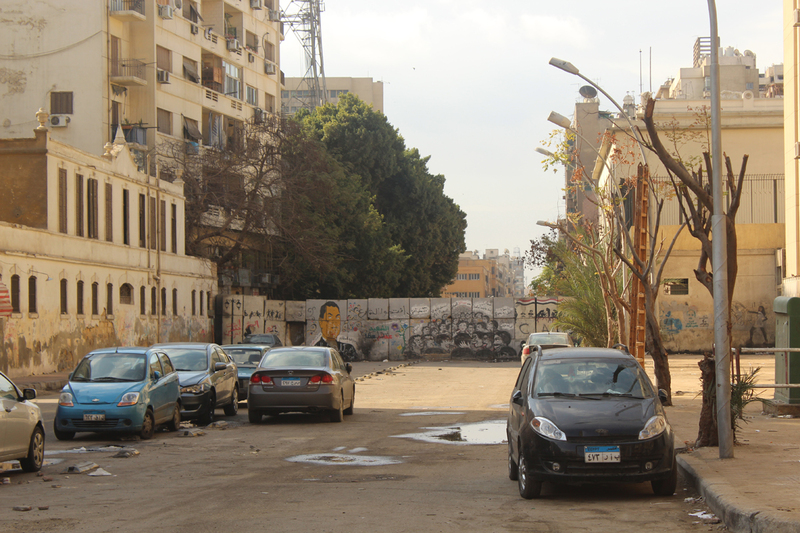 The neighborhood of the Ministry of the Interior, adjacent to Tahrir itself is a particularly expressive example of this extreme militarization of the city. 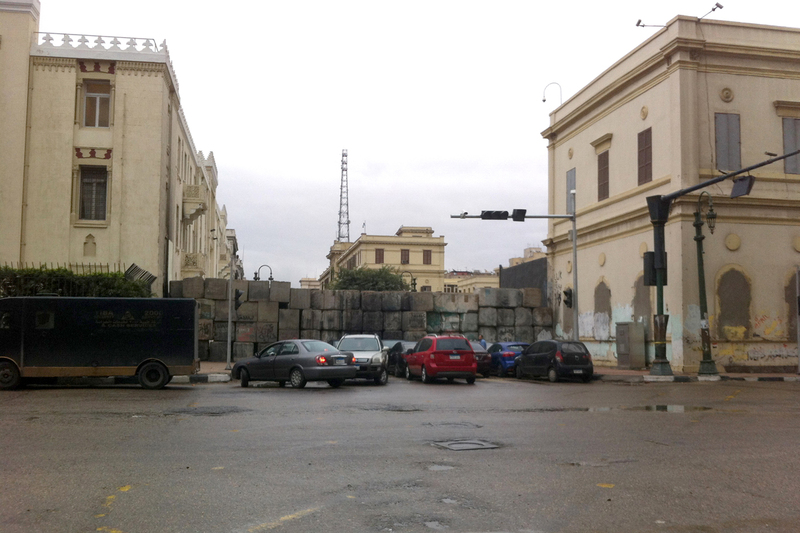 Manned tanks are also deployed at various points of the city (there was one behind the wall showed on the photograph above), in particular near Tahrir between the Egyptian Museum and the former National Democratic Party Headquarters. 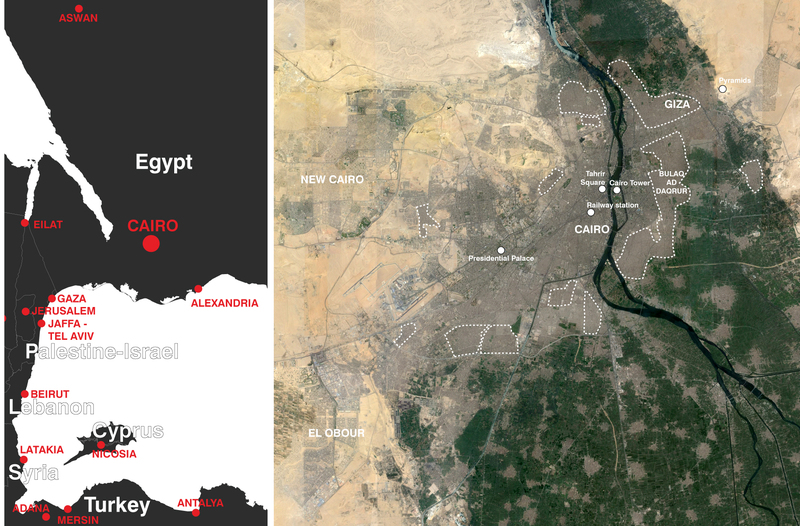 In March 2015, the Sisi administration announced that it commissioned the well-known architecture office SOM to plan a new capital city for Egypt, proving once again that “architects have an intrinsic aspiration to work with the military.” Situated a few kilometers East of Cairo’s newest developments in the desert, this city built on military-owned land with private corporations’ funds and that will hosts the national administrations and embassies is a perfect combination of military, political, and economic interests and inscribes the military authoritarian regime in the long term. 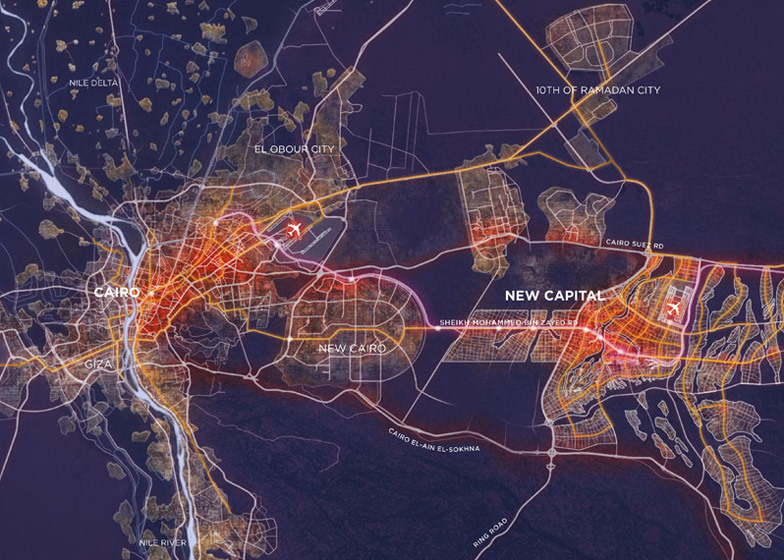 Although the details of the city are not clear yet, we can expect it to be a model of counter-insurrection urbanism; both for its military agenda, as well as the controllable rationale at work behind all new city’s masterplan. 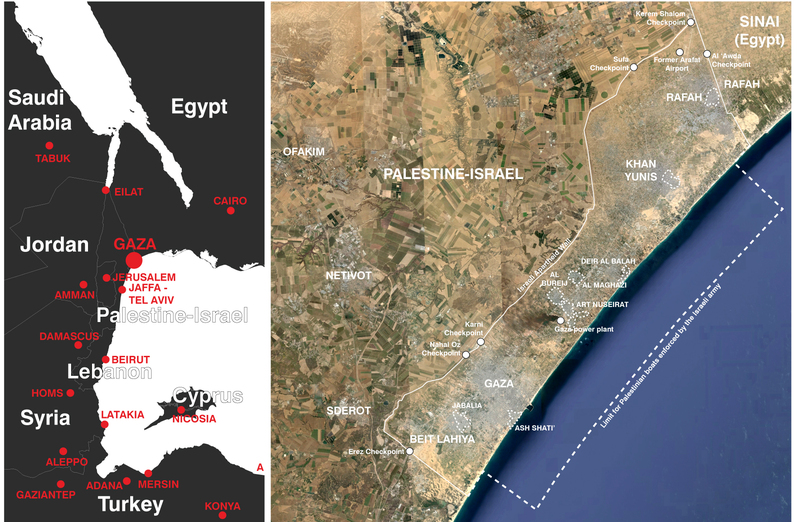 Overview of the Gaza Strip at the South-Western extremity of Palestine-Israel. See this 2014 map for more information. 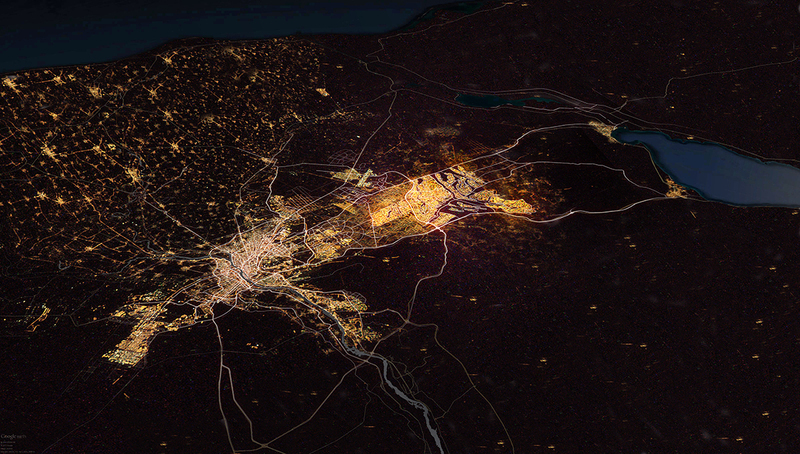 The city of Rafah (252,000 inhabitants) is particular for its location on both sides of the Egyptian-Palestinian border, not far from the Apartheid wall — between the wall and the city, lie the ruins of the Arafat International Airport that existed for less than two years (1998-2000) before being shut by the Israeli army, then bulldozed two years later. 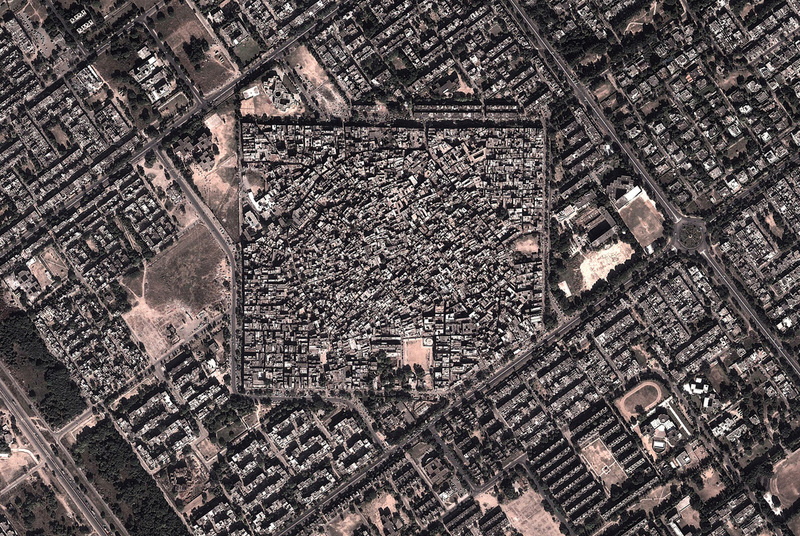 Two thirds of Rafah inhabitants live in refugee camps, generally in the Rafah camp that counts 75,000 inhabitants. I copy here what I had written in a previous article. 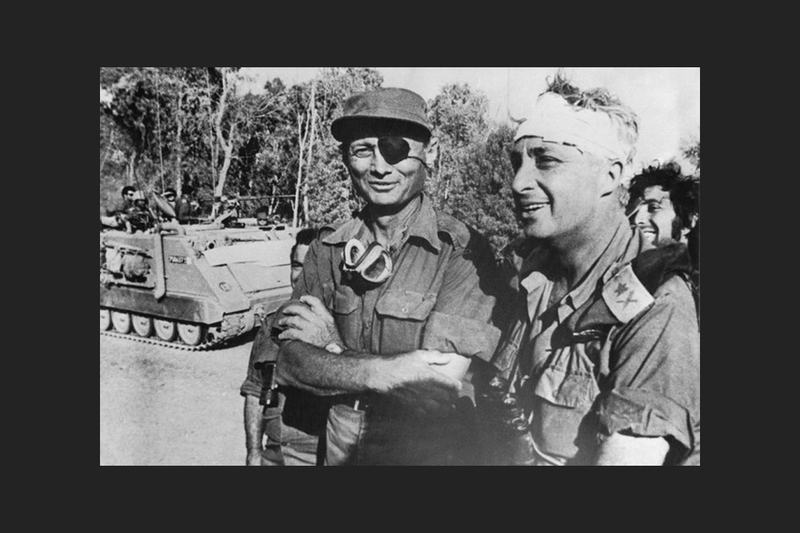 In December 1969, General Ariel Sharon — the same who was Prime Minister during the 2002 siege on Jenin — is named at the head of the Israeli army Southern Command after his determining contribution of the 1967 invasion of the Sinai Peninsula. In October 1970, the first Israeli settlement is built in the Gaza Strip, quickly followed by six others in the 1970s. The Israeli army thus wants to fully control Gaza and destroy the Palestinian resistance, particularly active since the beginning of the occupation three years earlier. In 1971, Sharon thus leads a mission of counter-insurrection that he recounts in his memoirs (Simon & Schuster, 1989) . Like other counter-insurgency specialists of colonial armies, from French Marshall Robert Bugeaud (see past article) to U.S. General David Petraeus, Sharon trains his soldiers to know the terrain on which they operate, as well as to think with the same rationale than the ‘insurgents.’ He also describes the various tactics used to detect P.L.O. hideouts in the Gaza urban fabric, some of which can be considered as quite architectural: we can think of the systematic use of knotted ropes to measure homes both from outside and inside to spot potential hidden rooms, as well as the use of folded ladders to conveniently observe what is happening behind private walls. As one can suspect, Sharon’s memoirs present the Israeli army’s actions as inoffensive to the Palestinian population not affiliated to the P.L.O., only briefly mentioning his decision to widen the streets of several refugee camps (mostly Rafah’s) and the massive home demolitions that result from it. Indeed, 2,500 Palestinian houses were destroyed by this operation of bulldozed street enlargement that will be reproduced thirty years later in Jenin. 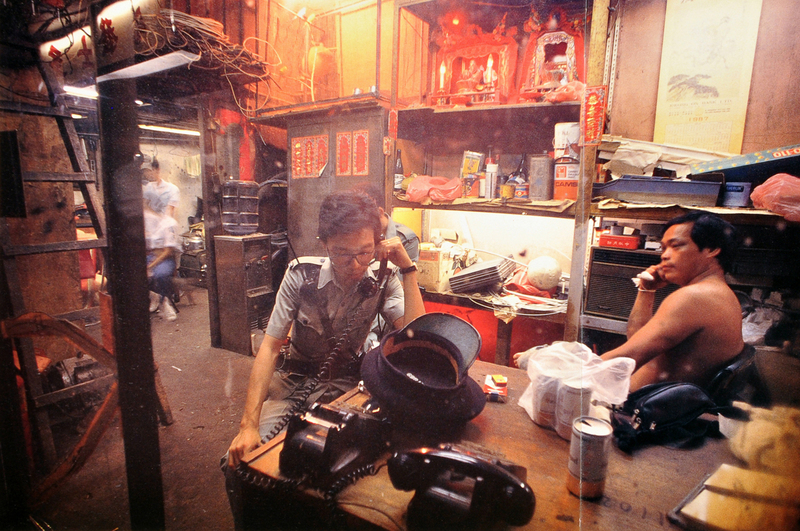 Dense urban fabrics always constitute a problem for the counter-insurgency officer, who occasionally improvises himself as an architect of destruction in the reconfiguration of these neighborhoods. The 16,000 inhabitants of Rafah subsequently homeless were offered to relocate in new neighborhoods nearby designed and built by Israel (called Brazil and Canada) providing that they will renounce their status of refugee and, thus their rights to return. After the 1973 Sinai War and the subsequent First Camp David Agreements in 1978, Israel withdraws both its troops and its civil settlements — they destroy them not to leave the infrastructure to the Egyptians, a technique reproduced in 2005 during the disengagement from Gaza — from the Sinai Peninsula. Until now, the border between the Gaza Strip and Egypt did not necessitate much of a materialization since Gaza was under Egyptian control between 1949 and 1967 and that both the Sinai Peninsula and the Gaza Strip were occupied by the Israeli army between 1967 and 1982. Ariel Sharon is now Minister of Defense — he will soon lead the Israeli invasion of Lebanon — and the bulldozers D9 are destroying another 300 Palestinian homes along the border to create a patrolling zone for the Israeli army. 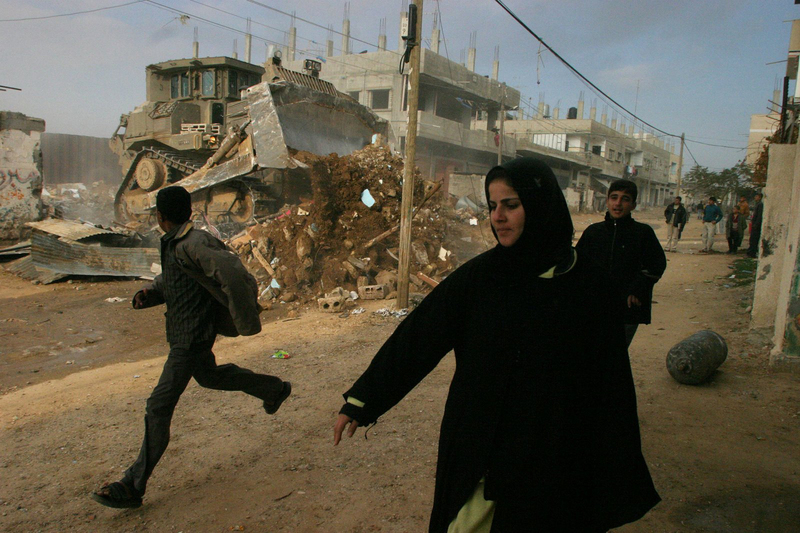 In 2002 during the Second Intifada, most of the Jenin refugee camp in the West Bank had been destroyed by the Israeli D9 bulldozers in a very short time-lapse (see past article). 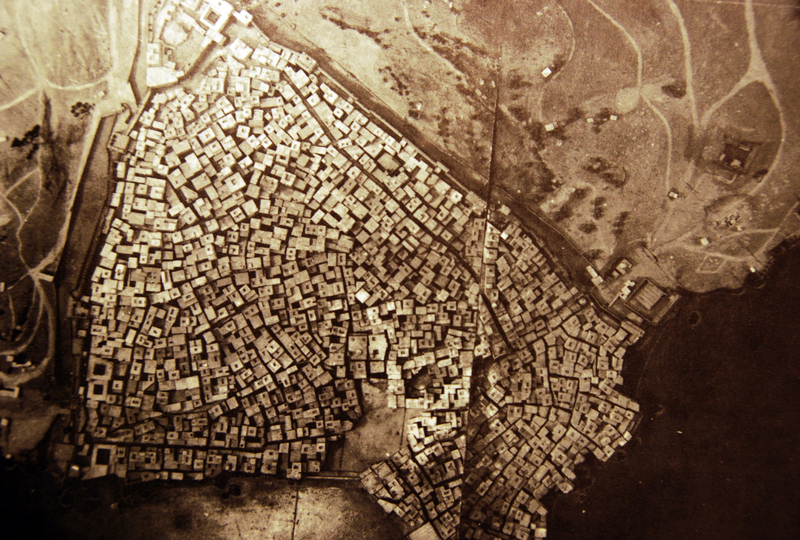 When reconstructed as seen above, the camp incorporated street wide enough to accommodate a potential return of the Israeli tanks as showed by Eyal Weizman in Hollow Land (Verso, 2007). In 2001, Sharon is largely elected as Israeli Prime Minister — this election was exceptionally a direct suffrage — during the Second Intifada that he contributed to start when he visited East Jerusalem’s Haram (the Mosque Esplanade) in September 2000. As we saw, the bulldozers D9 are massively used in Jenin’s refugee camp, but they also constitute the principal instrument of mass demolition in Gaza in general, and Rafah in particular (two thirds of the destruction). 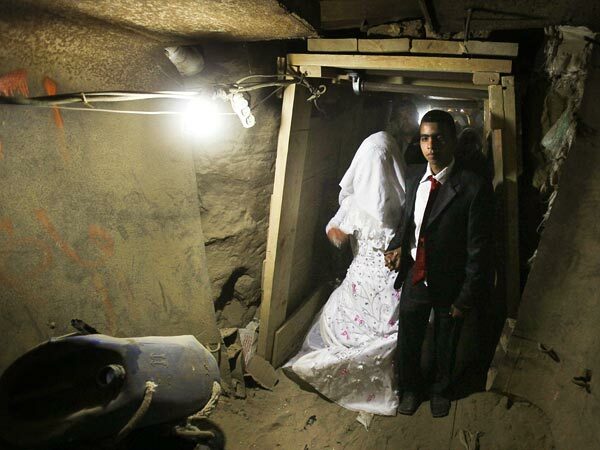 Between 2001 and 2004, 2,500 Palestinian homes are destroyed by them, in particular along the Egyptian border whose patrol zone is enlarged from a few dozen of meters to 300 meters. 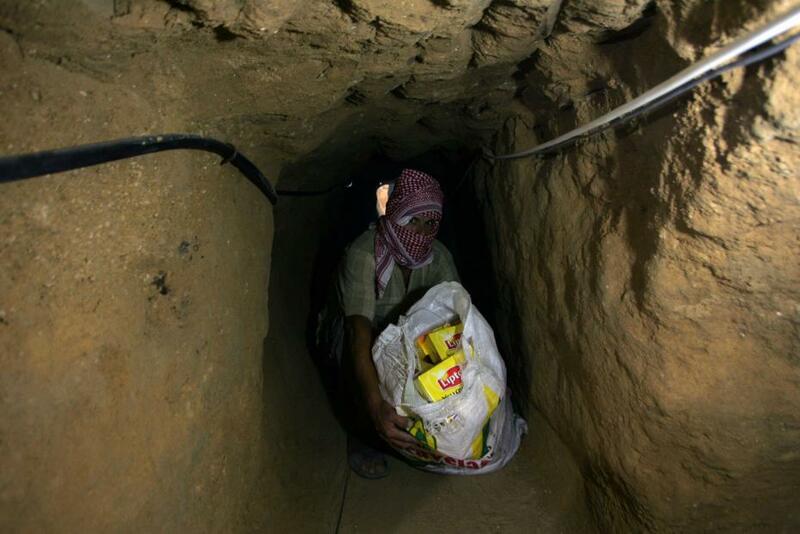 The Israeli army is particularly after the Palestinian contraband tunnels that are used to bring in necessary products banned from the blockade, as well as weapons for the Resistance. Many people died in their homes while they are being destroyed in an international indifference that seems to be only briefly shattered by the murder of Rachel Corrie, a 23-year old White American activist who placed her body in the line of a bulldozer D9 about to destroy a Palestinian house in Rafah (see past article). The Yasser Arafat International Airport that was grandly inaugurated in 1998 is also a privileged target of the bulldozers, which destroy its runway in 2002. You can read the 2004 Human Rights Watch report on the question to access a more detailed description of this wave of demolitions. 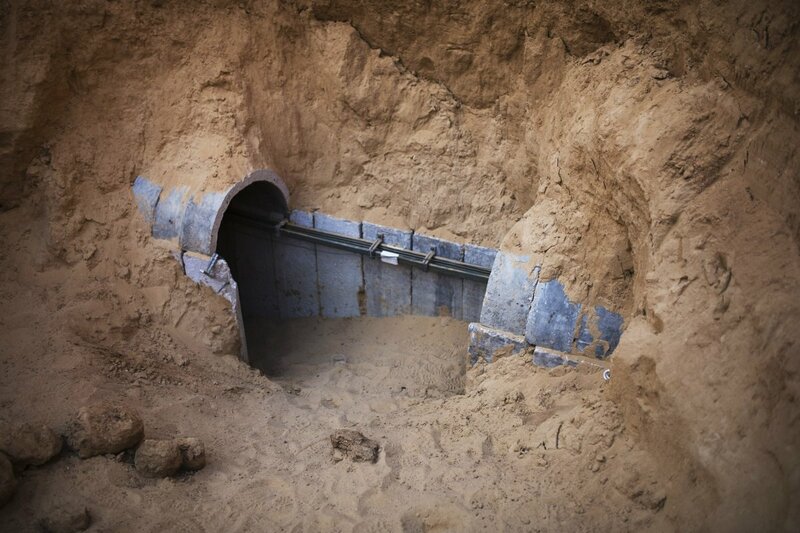 In 2015, the Sisi administration, hostile to Hamas, decides to create a 2,000-meter militarized buffer zone at the border, in order to prevent the contraband tunnels to operate, and in March, begins the demolitions. As friend Mohamed Elshahed writes in “The Erasure of Rafah and the Normalization of ‘Gazafication‘” (Cairobserver, April 25, 2015), the Egyptian government plans to demolish the entire Egyptian side of Rafah before the end of the year. I highly recommend the reading of this (rare) text on the matter to understand how the mass demolition of Rafah is taking place on both side of its central border, and a relative similitude in their process. 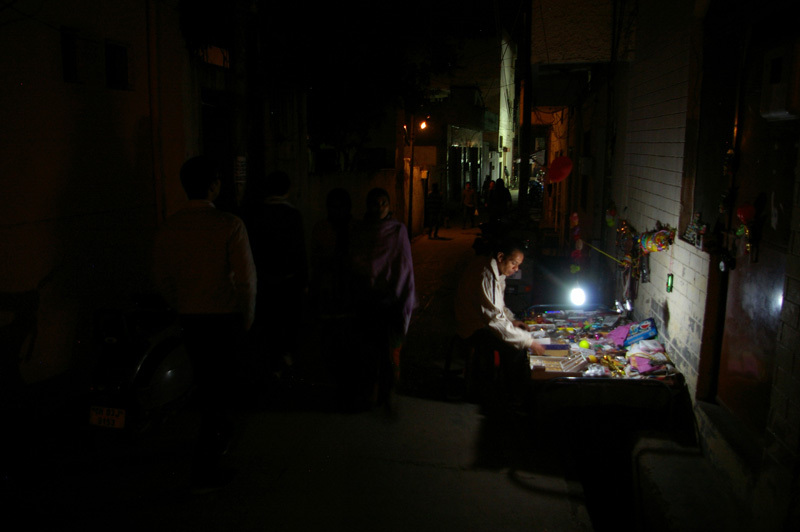 Let’s also recall that, in addition to the vital flux of contraband goods, Gaza also depends on Egypt for 22MW of electric power (about 20% of its general supply since the Gaza power plant was destroyed by the Israeli bombings in the summer 2014), as well as for the occasional opening of the Al’awda Checkpoint. The latter was regularly opened during the year of the Freedom and Justice Party (the governing avatar of the Muslim Brotherhood) administration lead by Presidend Mohamed Morsi (2012-2013), but this happened only sporadically during the Sisi administration. 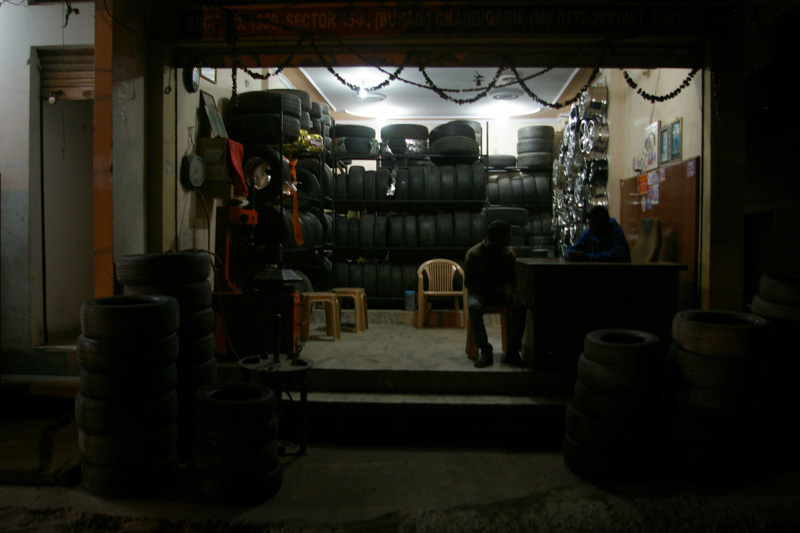 With time, the village became an intense place of economic production where people of Chandigarh go for products they do not find in the rest of the city (car mechanical parts, household electrical equipment, fresh vegetables…) and where migrants from outside the city can find shelter. Such an economic activity without urban codification led the village to grow significantly in density to become a built mass where the sky is often framed narrowly by the various vertical extension brought to older buildings. 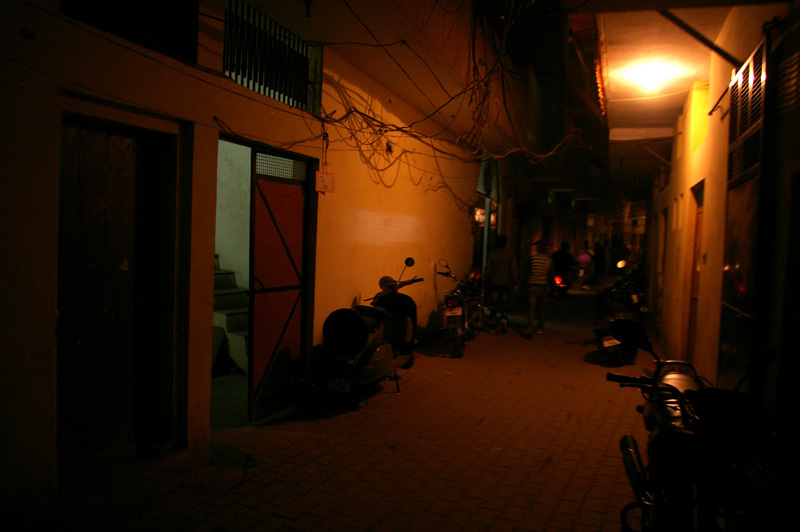 The labyrinthine aspect of the small streets inside Burail contrasts with the square properties of its limits that create a form of inhabited wall as an interface between the inside and the outside. 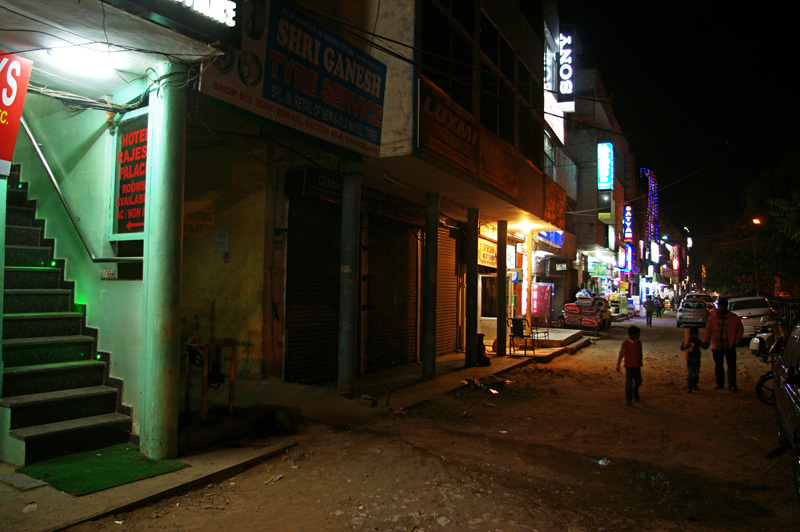 Troubles occasioned within Burail are mostly handled by the community itself that recurrently shows its political solidarity as Mayank explains: three years ago, a 5-year old child was kidnapped away from the village and killed. 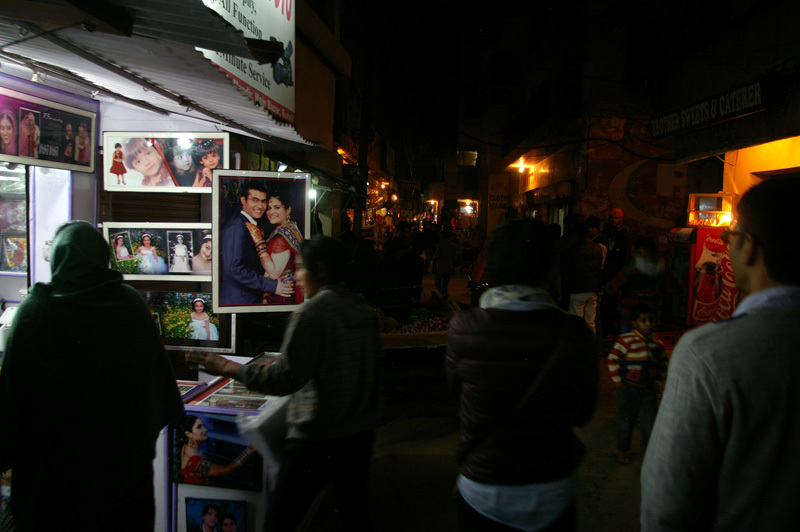 The commerce owners in Burail shut down their stores for three days and many inhabitants of the village faced the anti-riots police forces that were deployed around it (see this article in Chandigarh Tribune. Beware of explicit images). 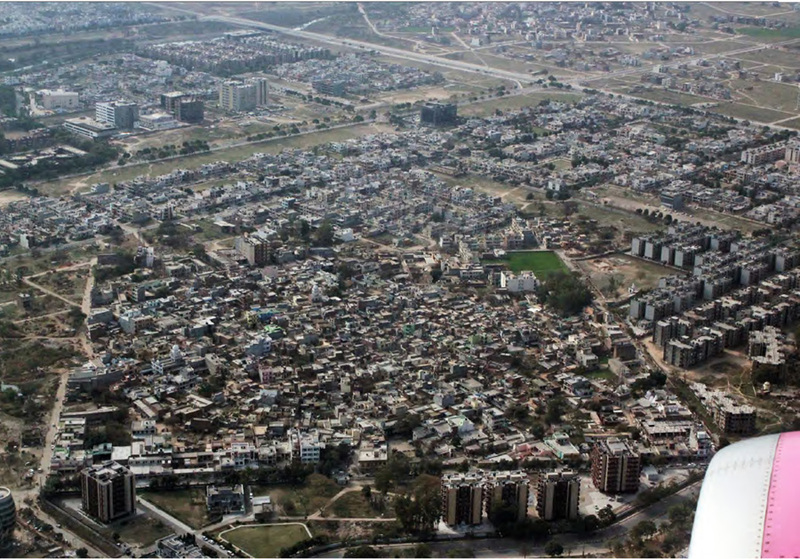 The existence of Burail as proletarian fortress is particularly remarkable in the context of a city that has been designed as an inhabitable machine by Le Corbusier. 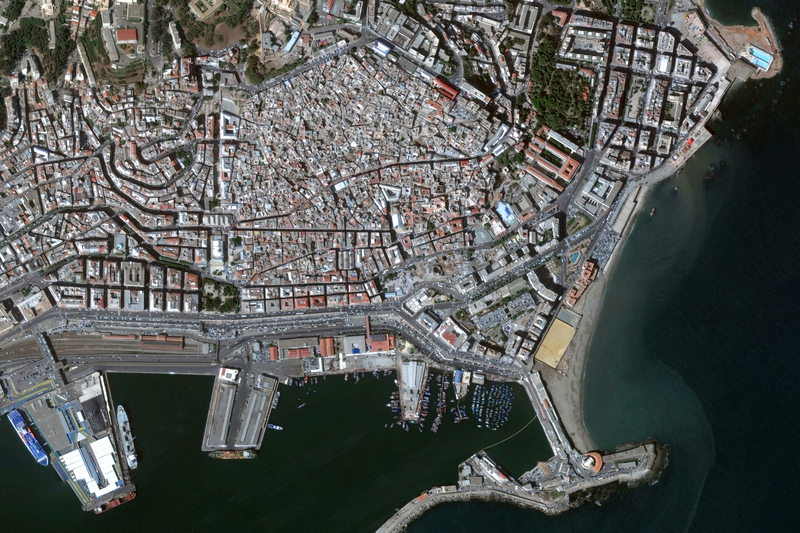 Two urban schemes are thus opposing each other: the rationalist grid of the modernist city and its labyrinthine anomaly. Burail is not a machine, it has not been designed in advance to optimize the set of its functions. 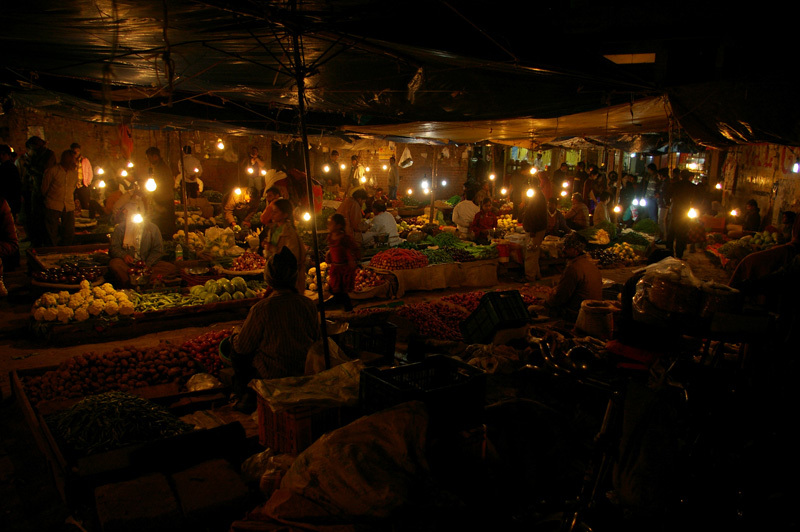 On the contrary, it grew and continues to grow immanently based on programmatic needs and opportunities of a moment. 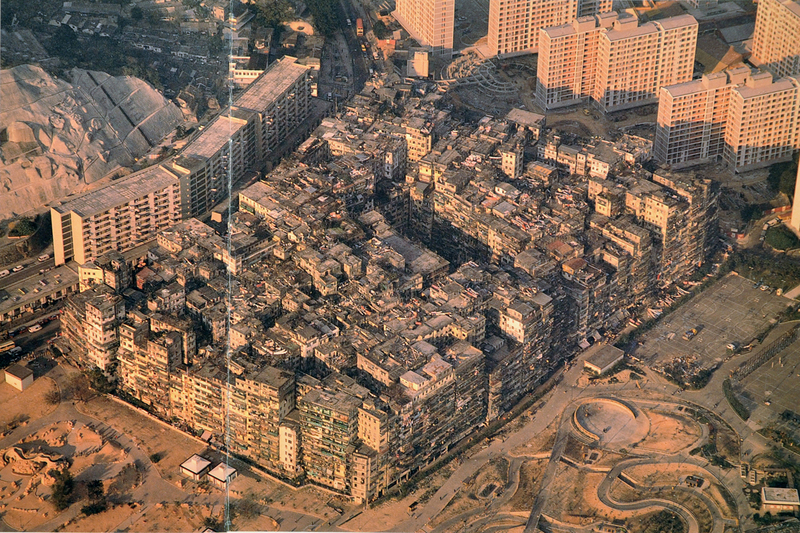 The Kowloon Walled City in Hong Kong is the only example of the five presented here that no longer exists — it was demolished in 1993. 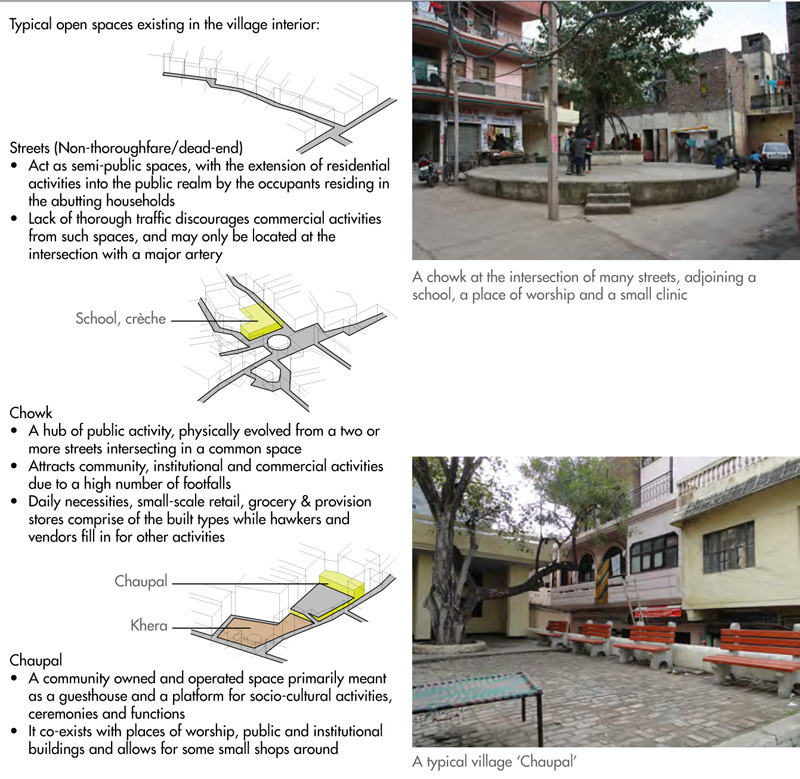 Incorporating it in this presentation was however important, since this compact neighborhood reaches such a degree of density that we can think of it as a sole gigantic building hosting 33,000 inhabitants, rather than a fragment of city as we would traditionally define it. 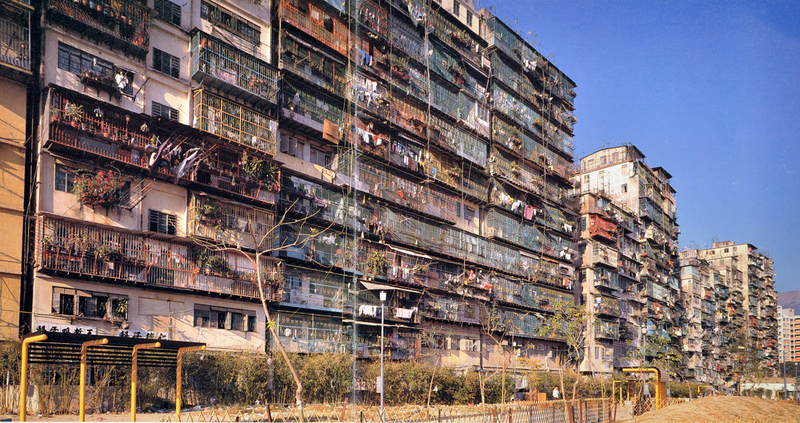 Although the Kowloon Walled City constitutes the paradigm of what I’ve been calling “proletarian fortresses” a few times in this blog, its name comes from the former Chinese military fort that used to exist on this location, prior to the 100-year arrangement regarding Hong Kong and the New Territories between the United Kingdom and China — Kowloon was effectively under British sovereignty between 1898 and 1997. 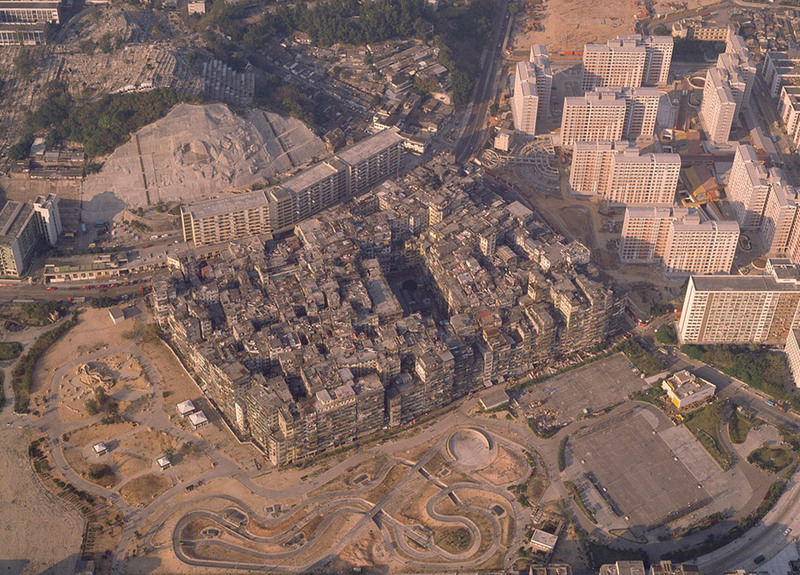 The residential complex that took its place was years after years the object of an architectural aggregation that gave its extreme density. 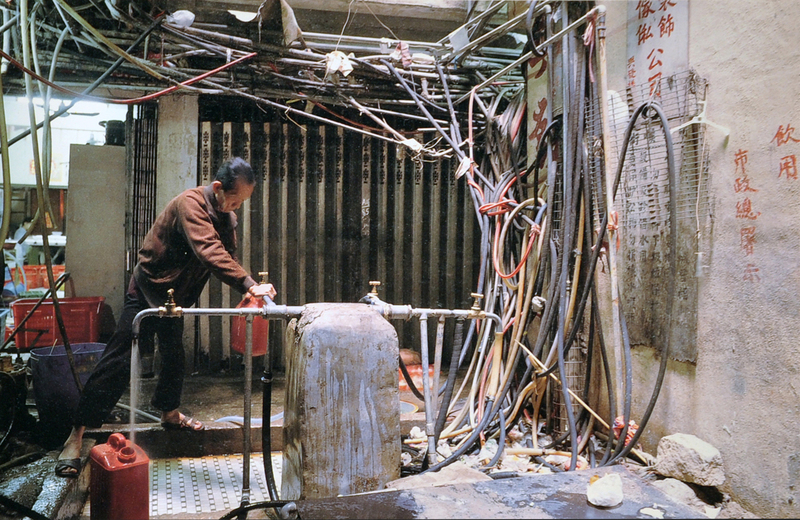 Retrospective fictitious section of the Kowloon Walled City by Japanese researchers. See past article for details. 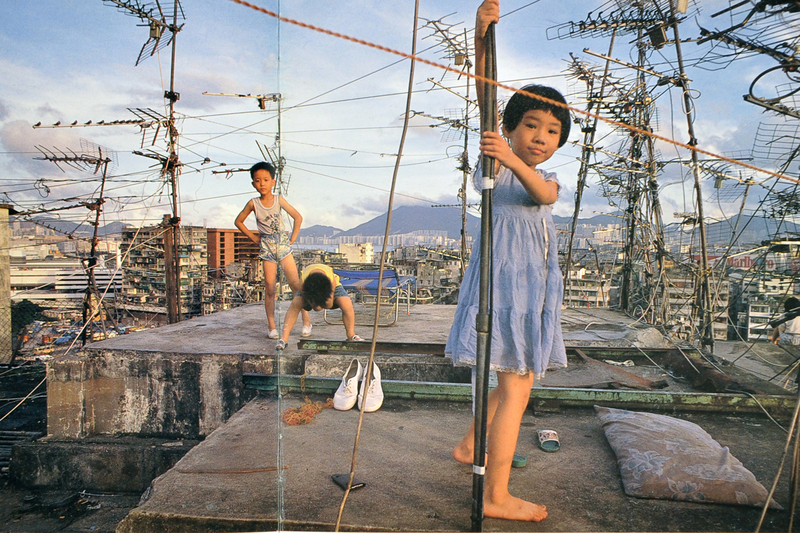 Following photographs from the book City of Darkness by Greg Girard and Ian Lambot (Watermark, 1993). 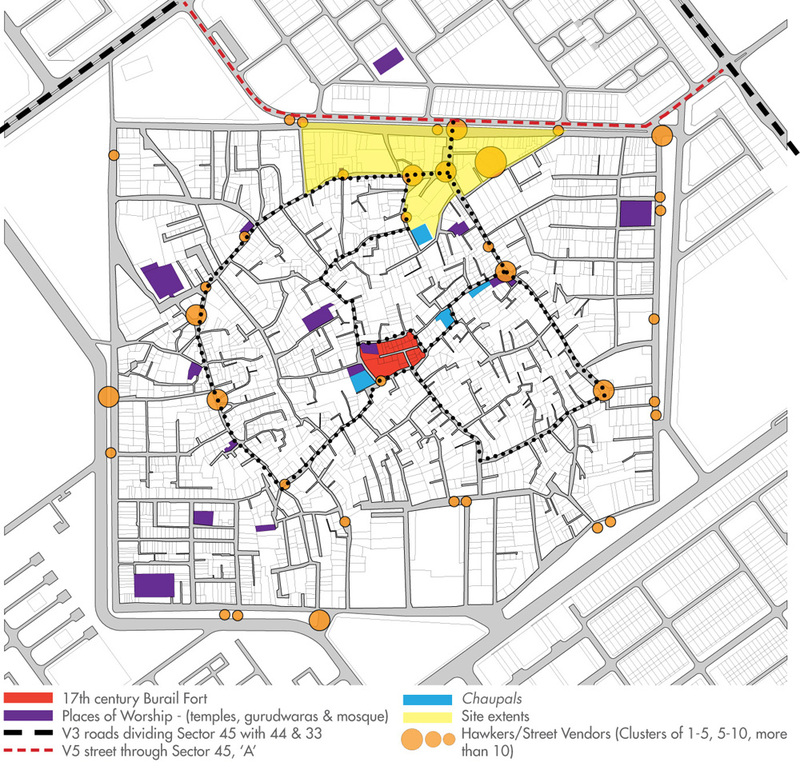 Girard and Lambot’s book is instrumental in demystifying the systematic criminalization of the Walled City by the British authorities and the rest of the city. 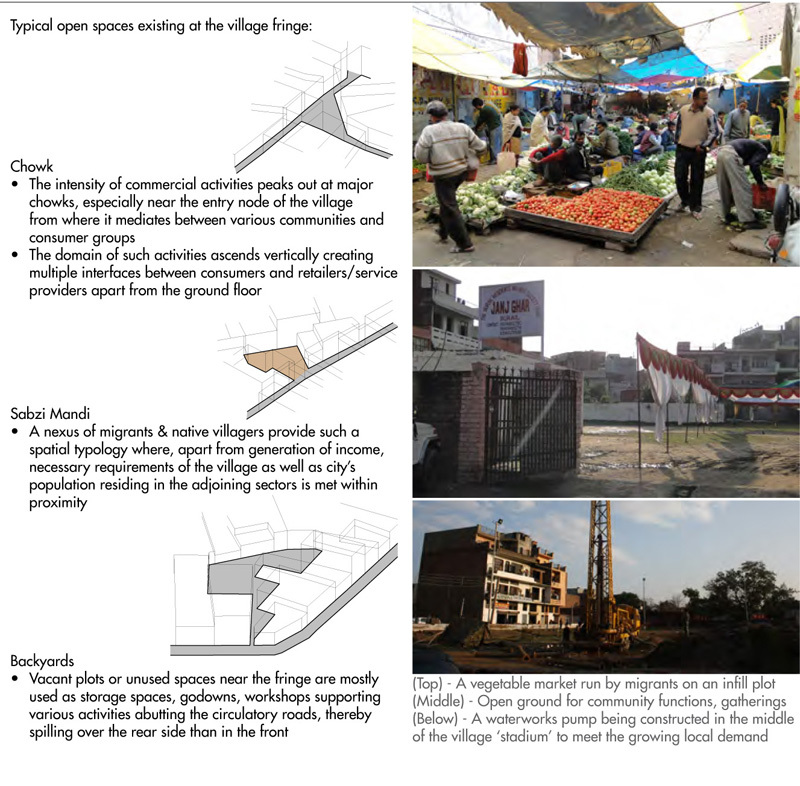 The authors are not denying the operative presence of some Triads groups, as well as drug addicted persons living in the neighborhood, yet, they also insist on the multiplicity of commercial and daily activities that composed the life of the Walled City during its existence. 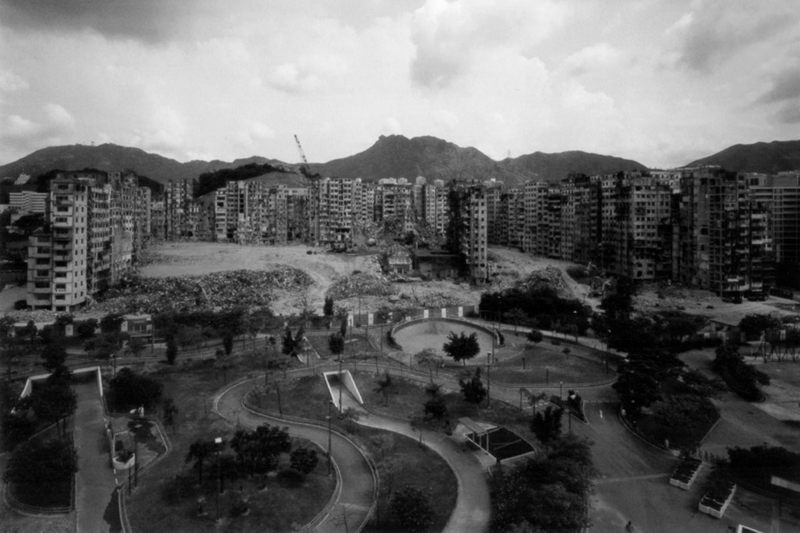 In 1993, four years before transferring the sovereignty back to the Chinese government, the British authorities undertook the demolition of the entire Walled City in an effort of eradicating a urban density impossible to control and that carries the potentiality of a local political organization — whatever it might be. 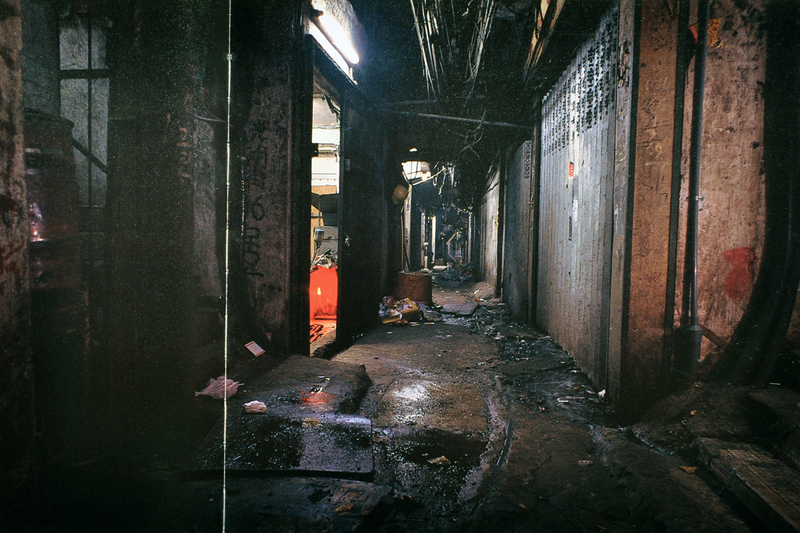 Japanese photographer Ryuji Miyamoto covered the eviction and demolition processes (see photo above). To my knowledge, the Walled City has never been the site of production of an insurrectional discourse and action; yet it constitutes a paradigm of urban formation providing the conditions for such an organization. 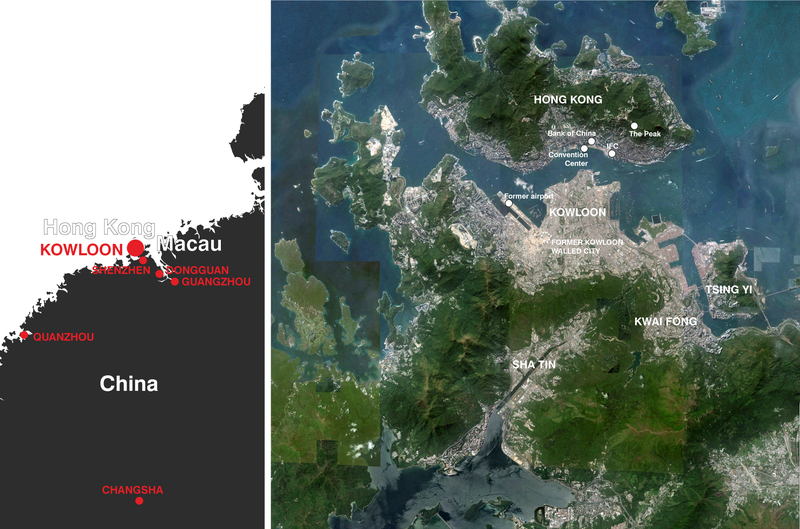 The criminalizing discourses that took the Kowloon Walled City for object as well as its inhabitants, even if based, to a certain degree on a actual facts, is common to all neighborhoods presented here. These discourses construct an imaginary of these neighborhoods that prepares the policed and/or militarized interventions against the urban fabric and its inhabitants. The insurrections evoked throughout this presentation are sometimes less the historical accomplishment of their inhabitants than a narrative forced upon them in order to (re)gain the full political control of these urban formations. 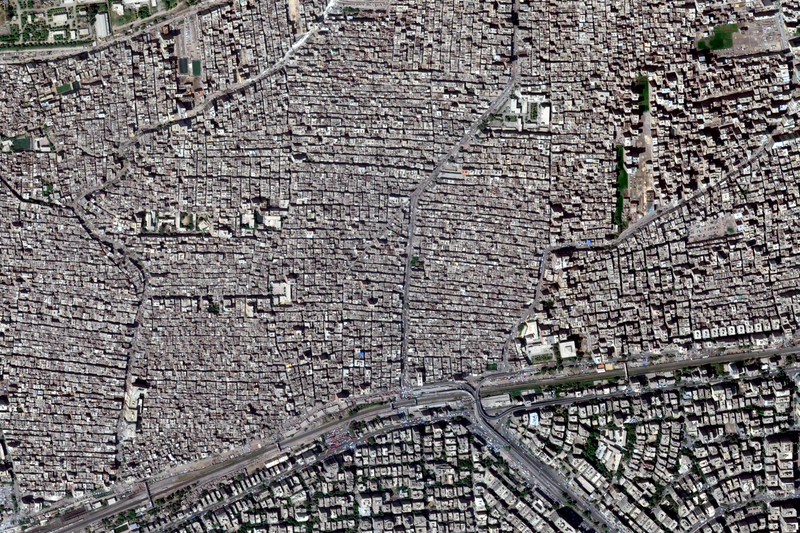 As described in another recent article, the rhetorical use of “bastions” or “strongholds” to talk about these neighborhoods or other similar ones, contributes (more often than not, deliberately) to their transformation or demolition orchestrated by the State, sometimes including the very lives of their inhabitants (like in the case of Gaza).